The fifth annual Toys For Tots Toy Drive and Classic Car Show is scheduled for Saturday, Nov. 21, from 11 a.m. to 3 p.m. at Johnson’s Corner Farm. The event is sponsored by the U.S. Marine Corps Reserves. A free hayride will be offered for each unwrapped gift that guests bring to the collection center at the farm market. The gifts will be distributed to needy and disabled children in Burlington County. As we approach Thanksgiving, the Johnson family encourages parents to use this opportunity to teach their children to give thanks for all they have by giving to those less fortunate. Marines will be on hand to collect the toys. The Classic Car Show will feature more than 150 vintage vehicles to browse as visitors enjoy the music provided by a DJ. The fall lunch menu will be available, featuring farm kitchen chili and soup, smoked pulled pork sandwiches, hot dogs, tater tots, hot chocolate and cider. Johnson’s Corner Farm is well-known for its Jersey Fresh crops and creating family memories, but also takes seriously its role in the community and participates in a number of charitable causes. 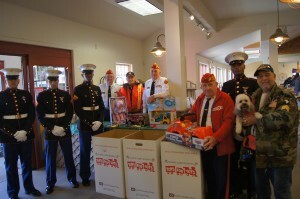 For more information, visit www.johnsonsfarm.com or the Marines’ Toys For Tots website, www.toysfortots.org.